Drown—a child can fall into a pool or bathtub while in a walker. See Pool Dangers and Drowning Prevention―When It's Not Swimming Time for more information. 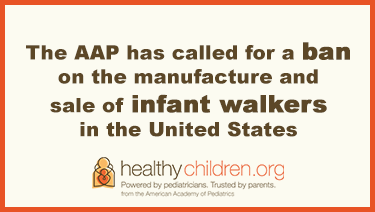 ​There are no benefits to baby walkers. Stationary activity centers—they look like walkers but have no wheels. They usually have seats that rotate, tip, and bounce. Baby walkers are banned in Canada! Under the Canada Consumer Product Safety Act (2004), Canadians are not allowed to manufacture, import, advertise or sell baby walkers. Canada is the first country to have such a law against them.